Instructional Design The following slides show the initial stages of developing a learning tool. These slides show personal sketches and wireframes executing the basic idea. Traditional learning methods rely on intensive memorization. This tool would not be a replacement for that study method, however, would be influential in building the correct mental model for each neural structure and system. Are the below representations of the fornix more clear? Do these images mean anything? Even if a viewer of this slide had zero knowledge of neuroanatomy, would it seem that each view below, the schematic, cartoon, or fMRI are meant to represent the same shape or structure? Thorough interaction = is to learn a sophisticated subject quickly and thoroughly. The fornix appears differently from multiple angles: shaped like the letter C yet posteriorly, appears to be a four pronged claw shape. The means that the user interprets this structure is the heart of this project. 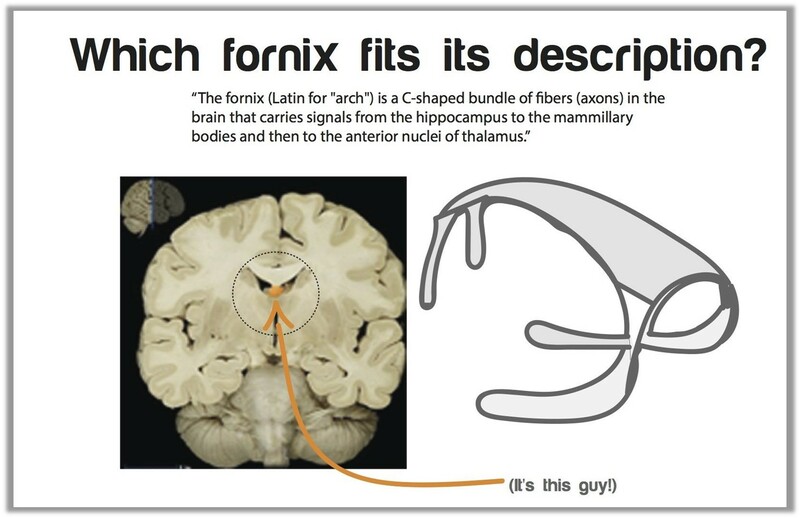 How does the user visualize the fornix? How can they interact with the fornix digitally in various formats so as it internalize the knowledge, coding the information into their long term memory? One feature meant to target dynamic learning could be a structure library within the tool. The user could engage with the structures in a variety of ways, particularly those that build knowledge: movement, repetition, visualization, incorporation into other formats or circuits, etc. The tool would show a panel of structures, organized by primary feature. The user could select structures and drag them to a white space to build the circuit and explore the relationships between them.